Published: Oct. 10, 2012 at 11:32 a.m. Updated: Oct. 10, 2012 at 03:41 p.m.
Former Detroit Lions defensive tackle Alex Karras, who died at the age of 77 on Wednesday, means a lot of different things to lot of different people. For fans of the Lions, he was one of the best interior defensive linemen of his era. 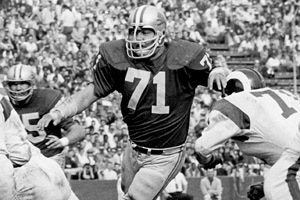 A three-time first-team All-Pro, Karras made the 1960's All-Decade team. For comedy fans, he was Mongo, one of the most memorable characters in one of the greatest comedy films ever made: "Blazing Saddles." For football historians, Karras signified a new NFL era. His year-long suspension, along with Green Bay Packers golden boy Paul Hornung's, for gambling on football helped define Pete Rozelle's era as NFL Commissioner. During Karras' year away from football, he tended bar in Detroit. And then he was a first-team All-Pro the following year. For people of my generation, Karras was George Popodalopus from "Webster." For lovers of football books, Karras was the most colorful character in George Plympton's classic "Paper Lion" and the follow-up "Mad Ducks and Bears." He also played himself in the movie version of "Paper Lion." The book changed his world. Karras called the 40th reunion of the characters in the book the third-biggest thrill of his life. "The first two were falling in love, twice," he told the Detroit Free Press in 2003. For "Monday Night Football" fans, Karras was one of the most bizarre and funny color men the show has ever seen. For someone like me, Karras is one of the biggest connections to understanding an entire free-wheeling era of football. Before "Prime Time," Karras knew how to make himself larger than life in a fledgling sport. Karras' personality was so big that his play on the field tends to get lost in the shuffle. Don Shula once was asked which player who isn't enshrined in Canton deserves to be there. Unprompted, he said one name: Alex Karras. For fans of 1960s football, that's how Karras will be rememberd.